Outside my window... there is still some snow on the trees and ground from yesterday! 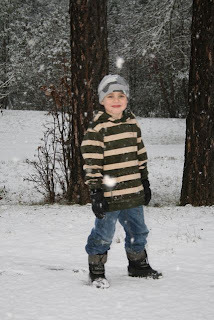 It was a nice surprise for the forecasted rain to turn to snow and my children immediately headed outside to play. I am hearing... the soft breathing of my little girl sleeping in my arms. I am thankful for... Hubby's brothers, who are always willing to fly out to administer the sacrament of Baptism to our children. This particular brother-in-law has baptized all three of our daughters! (In fact, Twinkle Toes was his first baptism ever as a newly ordained deacon at the time.) Thank you "Uncle Father!" I am praying... prayers of Thanksgiving for our precious little baby's safe arrival and baptism, and that the little holes in her heart close quickly. I am also praying for Kelly and a number of other friends whom I have promised prayers. From the kitchen... 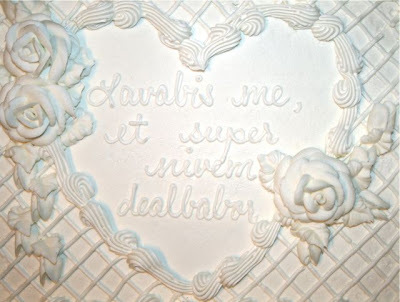 TONS of delicious white cake with vanilla cheesecake filling, leftover from the Baptism. We planned to pick it up to take to the coffee shop right after the baptism, to share with all the friends and family that were able to attend, but it wasn't quite ready for pickup and we ended up getting it later that afternoon to bring home for after dinner. If anyone would like a piece, come on over! "Thou shalt wash me, and I shall be made whiter than snow." From the learning rooms... nothing at the moment. Though I do need to start planning soon! Living the Liturgical Year at Home... I have so many pictures to share from Christmas Day... It was wonderful! I also have a newly blessed bottle of wine from the feast of St. John. (Another benefit to having a priest visiting right after Christmas this year!) 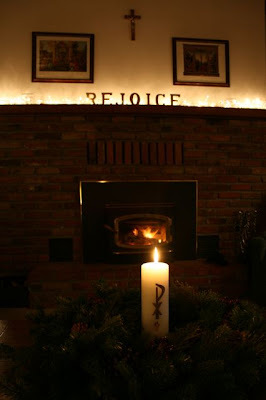 Our Christ Candle replaced our Advent candles for the Christmas season, and the Advent Mantle was updated with the word "REJOICE" in gold as well! I am still trying to decide what we will be doing to celebrate the Solemnity Feast of Mary the Mother of God/Circumcision of Our Lord, but I still have a couple days, right? Other than attending Mass, what will you be doing with your family? 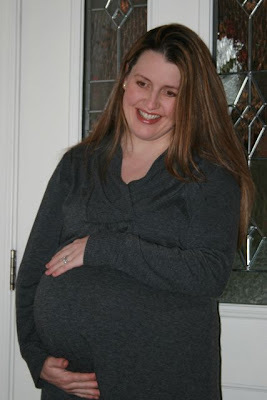 I am wearing... maternity clothes, still, and probably will be for awhile! I am reading... The Mission of Motherhood: Touching Your Child's Heart for Eternity which was recently given to me by a friend. I have only just started, but so far it is wonderful! I am hoping... that it won't be nearly 5 years before Father is able to come out for another visit... We miss him already! 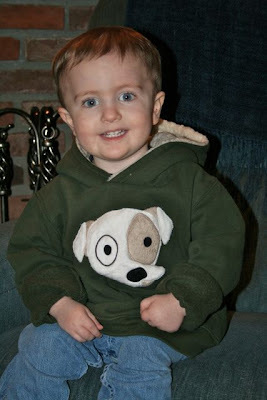 Noticing that... our little Snuggles is not a baby anymore! When did he grow up???? He sure loves his new little sister and will spend every opportunity he can get snuggling with her. Around the house... lots of evidence that we have a new little one living in our home. Baby Blankets, a Boppy pillow, burp rags, bouncy chairs, and a darling moses basket can be found scattered all around. Not to mention all the new Christmas and Baby gifts... Time to start decluttering again to make room for it all! One of my favorite things... the smell of chrism on a newly baptized baby. Our little Rose still smells just heavenly! Start Planning our Back to School "Schedule"
Taken by Captain as I was leaving to go to my scheduled OB appointment on December 15th at 4:00 pm... The very last photo of "Rose" in my tummy! Little did I know I would be holding our sweet little girl later that very night! 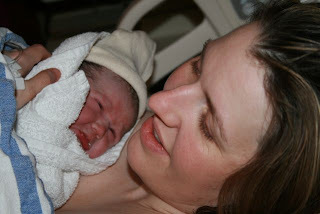 Taken by Hubby moments after delivery. 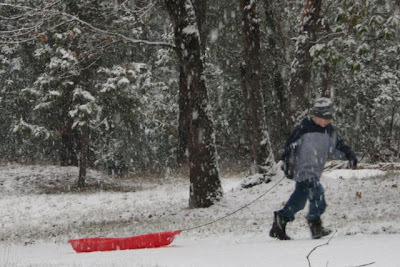 I also haven't been consistent about blogging during the Advent/Christmas madness - but I don't have such a great excuse as 6 kids and a medical condition! Will be praying for you and your sweet little baby girl especially this Christmas season! Thank you Cita! Funny thing is, one of my boys just pointed out last night that I have "a double chin just like the baby now!" Children are too honest sometimes... lol! 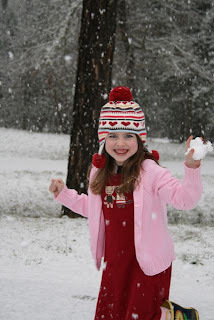 Annita ~ Yes, I do think of this blog as our family scrapbook, and did start blogging for that very reason. I never realized I would also gain so many blessings, prayers and new friendships as well! Thank you for visiting and a Blessed New Year to you and your family!!! I really enjoy your blog. Your family is such an inspiration to me. 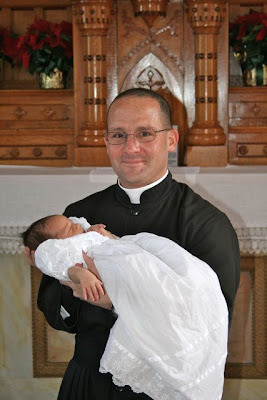 Your brother-in-law/priest pictured in this blog was our priest for awhile in KC - we love him and miss him, though get to see him once in awhile when we go west. As for the lower spine issue, do you know any good chiropractors? If you can find one who has a good reputation, that would probably do you more good than a physical therapist. Just throwing in my 2 cents. I have been going to chiropractors for years, both for temporary problems and for preventive health. They have worked wonders for me. You have a beautiful family. Congratulations on your 6th! We are due with #3 around Easter. Chrism is also my favorite smell after baptism. Can't get enough! I don't have all of my cards out either ... But I don't have a good excuse, like just having a baby, like you do =) The Christmas season isn't over, though, right?! Wishing you much joy and peace during these days of transition for your family ... And happy new year, too! It's good to see you holding baby Rose. There is nothing sweeter than a new baby...burp rags and all. A friend had some issues after delivering her almost 11 lb baby boy last May. Her physical therapists and then a chiropractor did wonders for her. I'm praying you'll feel better soon too. Our family has gone through some of its own changes recently, but it has brought some saddness and hurt with it. If I may ask for your prayers as well Jessica it would be so appreciated. On that note we are looking ahead into the Feast of Epiphany. Our kids will be making a cake for Our King and have a little gift tucked under their bed (my mom use to do this when we were kids). We'll bless our home and add our wisemen to our nativity.